AAM has successfully completed more than 30 governmental contracts and numerous contracts for industrial clients, developers and engineering firms. Working in the government sector our clients have included the SFWMD, FFWCC USACE, FDEP, NPS, Lee County, TNC Disney Wilderness Preserve, Citrus County, Federal Aviation Administration, Palm Beach County, Manatee County, FDOT and others. It is evident by our record with the FWC and other Governmental Agencies that AAM has utilized sound business practices and performed superior work. 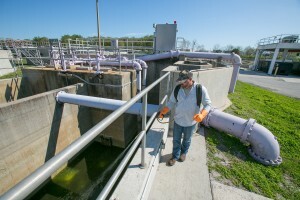 Since 1981, we’ve carried out operations for aquatic plant management on many of Florida’s public water ways including Lake Okeechobee, Lake Kissimmee, West Lake Toho, Lake Poinsett, Lake Winder, Lake Rousseau, Lake Seminole (both), Lake Jackson (both), Wacissa River, Lake Talquin, Kissimmee River and St. John’s River to name a few. Control operations on these lakes and/or river systems have included floating, emergent and submersed applications ranging from <1 acre to well over 5,000 acres of target vegetation. AAM takes pride in our reliable, diligent, efficient personnel. All employees are educated and licensed in the application and handling of herbicides. Presently AAM employs 67 licensed Applicators in the aquatic, natural areas & right-of-way categories. Our Applicators are certified by the Florida Department of Agriculture and Consumer Services, and receive continuing education annually to keep up with today’s complex regulatory environment. Over the years, AAM employees have received numerous industry awards and recognition for outstanding service and leadership. In addition to our knowledgeable and experienced staff, AAM is equipped with 52 airboats and 68 transport/spray trucks specifically designed for the application of aquatic herbicides. Our impressive fleet also consists of 4 outboard powered boats for application of aquatic herbicides in areas with limited access (low bridges etc.) and for areas where less disruptive application is warranted (i.e. areas where the endangered Everglades snail kites nest). We also have a wide variety of boats available for use in small ponds and/or large lakes and multiple truck mounted systems for use in industrial settings and ditch herbiciding. Other available equipment includes a railroad spray car, a fleet of four- and six-wheeled as well as tracked ATVs and swamp buggies all equipped with state-of-the-art spray equipment designed to provide the most effective and cost efficient management services for all types of terrain.